In our ark, we are privileged to have a special memorial Torah. 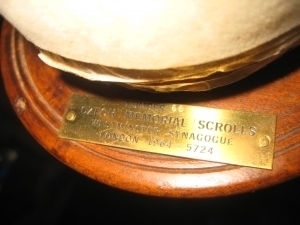 Temple Israel’s Holocaust Torah is from Nachod, a town in the Czech Republic. This special Torah came into being in the 18th century, when the United States was taking form. Nachod is one of the oldest Jewish Communities in the Czech lands with Polish Jews residing there prior to 1340 along with Prague, Kolin, Mlada Boleslav and Roudnice. The sixteenth century synagogue, which was rebuilt in the eighteenth and nineteenth centuries and even survive the Nazi occupation was demolished under the Communists in 1964. The Nazis destroyed The Old Cemetery which had stones dating back to the mid seventeenth century. When the war ended, a prayer room was established which was later converted into an apartment. A purposeful career spanning three continents came to a gratifying conclusion as he tearfully looked at the Torah scroll he had held in his arms as he celebrated his first Sabbath as a “rabbi, teacher, and preacher in Israel” in a Bohemian Jewish community that is no more. 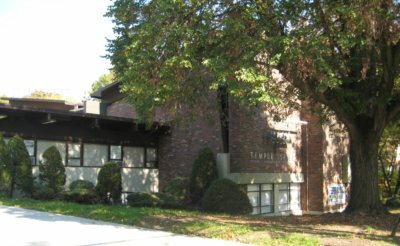 Rabbi Stransky looked down upon the congregation gathered in the sanctuary of Temple Israel to receive the old Torah scroll from Czechoslovakia.